The world’s leading car producers have spent a century developing and refining their brands, with the car always sitting at the core of their offer. As such, the industry is built around engineering and design: creating perfectly built cars, with a balance of parts working smoothly and precisely together, and a continuously refined driving experience. However, in today’s world, cars alone and the services built around them won’t be enough to sustain auto companies. The rise of carsharing and ridesharing services, along with new subscription models providing multiple forms of mobility, has meant that the mobility needs of consumers are becoming increasingly dynamic. Their expectations no longer revolve predominantly around the car. The foundations of mobility ecosystems started to emerge with the investment in connectivity in order to make the experience around the car more seamless. These initiatives have provided a consistent flow of user mobility data that has given rise to new types of service offerings. The risk for carmakers is to get established in the mobility services industry only as data producers and data providers. Being a raw data producer offers limited opportunities for the brand and for customer engagement. But becoming a service provider would offer the possibility to evolve the brand image, keep it visible and present in the mobility market. Carmakers must invest in and build the necessary expertise to identify the multiple service opportunities within their existing data sets. If they fail to do this they risk losing relevance as third party companies continue to access the data and build mobility solutions of their own. Many car manufacturers have already started to offer digital services that draw on data and try to cover many different use cases. Some examples are Mercedes me, Daimler’s Car2go and BMW’s group of Now services (DriveNow, ParkNow, ChargeNow). The problem is that most of these services either still revolve around the car itself or the solutions generally haven’t been interlinked. As a result, the experience for consumers is fragmented. One service that is starting to create a more interlinked ecosystem though is Whim. With its subscription-based model, the company offers access to different mobility solutions that the user can choose based on their needs. Whim is essentially playing the role of an orchestrator of mobility offerings. With this, the car becomes just one element within a mobility ecosystem of connected products and services. It’s this model that traditional carmakers must start to emulate within their own businesses. An ecosystem is, by definition, composed of various services and products that belong to disparate departments and business areas. 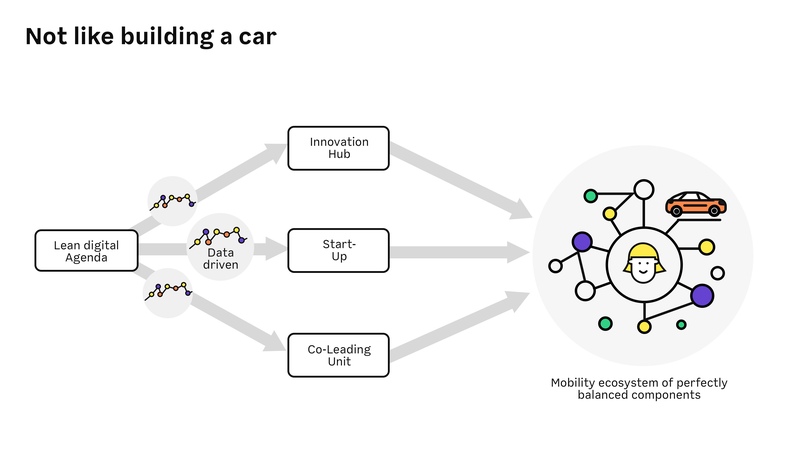 To build this ecosystem, automotive companies need to be structured in a way that enables greater collaboration across departments. Decision makers need to be enabled through a more agile and independent process, instead of a hierarchical and vertical one that most carmakers currently operate. Futurice has experience in guiding small and large organisations in the cultural transformation that facilitates this. We believe that automotive brands should start organising their businesses around a Lean Digital Agenda. This strategic initiative combines a company’s various assets – its brand, knowledge and technologies, business insights, customer data, etc. – into one unified picture, providing a clearer vision and a deeper analysis of a company’s current offering and the wider market. It covers all departments to set a common direction and a unified offer. On top of this, the Lean Digital Agenda consists of an actionable strategy that considers the profile of the company, its history, its strengths and weaknesses to determine the next steps in achieving the vision. It also, crucially, determines how a brand’s raw data should be interpreted and which untapped business opportunities that emerge from the datasets should be pursued and how. With this more holistic approach, companies are better able to identify the biggest opportunities, as well as the gaps in their service vision. Multiple new projects or lighthouse initiatives can then start to emerge and help carmakers to achieve the ultimate goal of building their integrated mobility ecosystem. These initiatives could be in the form of startups or innovation hubs that are responsible for incubating and offering new mobility services for the market. Or it could be through co-leading initiatives, where the automotive brand and a company like Futurice jointly drive specific internal projects to help achieve the vision goals. Throughout the process, data is pivotal. During the Lean Digital Agenda, it should be continuously analysed to validate and refine the vision, something which should never remain static. At the same time, data is the fundamental building blocks for developing services and verifying the success of the ecosystem. In this continuous loop of validation and creation, the mobility ecosystem can grow and the brand with it. Cars are a perfectly engineered and balanced set of parts that make up the driving experience. In a similar way, mobility ecosystems should be a balanced and interconnected set of services and products that answer the new mobility needs. 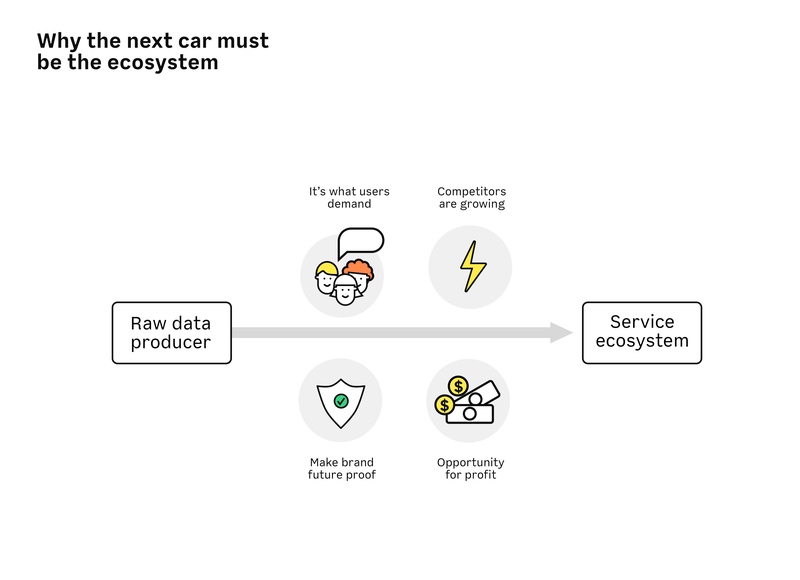 Putting the ecosystem at the heart of their offer will be critical for auto brands if they want to remain relevant and competitive in the era of services.